This is a smart looking watch. This magnificent ladies watch from August Steiner features an etching dial with genuine diamond hour markers. The Swiss quartz movement makes this dazzling timepiece a great addition to every woman's wardrobe. I love how this watch looks but after wearing it for a while the rose gold coating has worn off quite a bit. This is a lovely watch that meets my expectations and is very attractive too. I like that it isn't a stretch band as it doesn't pinch me this way. The clasp is easy and secure to work. Just the right size--not too big and not too small. A good buy for sure. Advertising was accurate. I have had it for a few weeks now and would definitely recommend it to a friend. I love this watch! It was a great buy and is stylish and easy to read. There is no reason to have to spend hundreds of dollars on a watch! 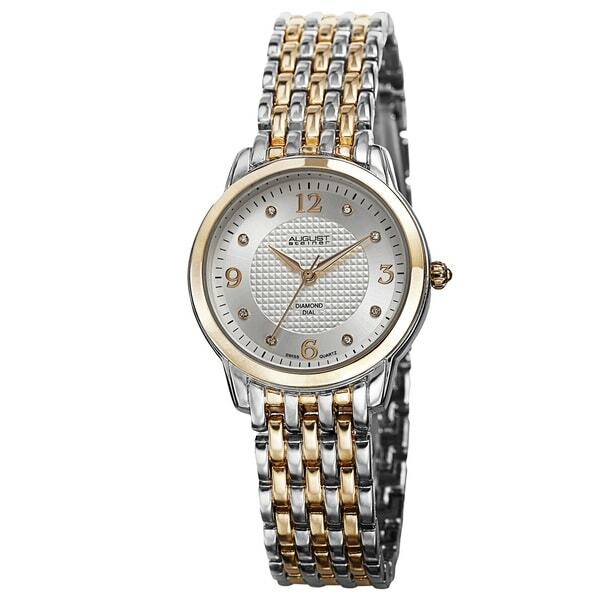 I would order this watch again and love the way it is two colors to go with whatever jewelry I wear. This is a beautiful watch but the diameter is too big for my taste so I exchanged it for a smaller diameter watch. I still would recommend this watch to add to your jewelry collection if it suites your taste. Beautiful. Watch but stop working due to moisture from washing hands and metal on back turned discolored. Just beautiful but was too heavy for my wrist. Returned, didn't like it, too large!